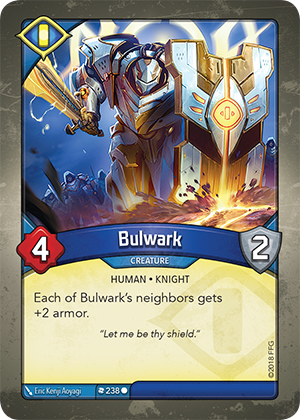 Card Text Each of Bulwark’s neighbors gets +2 armor. If Bulwark leaves play, do its neighbors get to hold on to their armor bonus until the end of the turn? No. Constant abilities (such as Bulwark’s) are active so long as the card remains in play. Therefore, the armor bonuses from Bulwark cease the moment Bulwark leaves play. What happens if the armor Bulwark provides to its neighbors is used up, then you return Bulwark to your hand and play it again? Does it give fresh armor? Yes. Treat it as though it were played for the first time again. If one of Bulwark’s neighbors leaves play and another creature becomes Bulwark’s neighbor, does the new neighbor gain +2 armor immediately? Yes. All constant abilities (such as Bulwark’s) are always active and immediately apply.